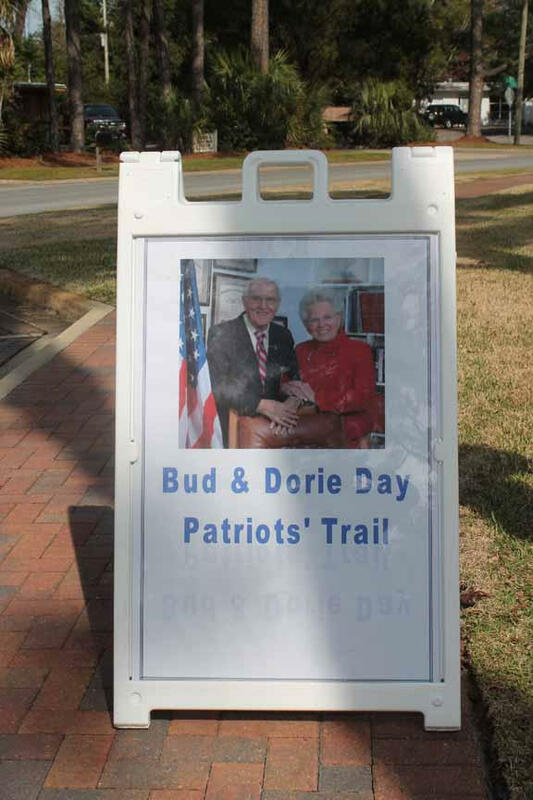 The Bud and Dorie Day Patriots' Trail will wind through a neighborhood behind Uptown Station on Eglin Parkway. The trail has been a community effort from the very start. The city of Ft. Walton Beach donated the land and the greater FWB Chamber of Commerce has taken charge of fundraising the $100,000 needed to build it. Ted Corcoran, the Chamber of Commerce President said the community was looking for a unique way to honor Bud Day who called the area home for over three decades until his death last year, "He has statues; he has airports around the country named after him. He is honored is so many ways. How is our community going to acknowledge him after living here for so long?" Corcoran said several possibilities were talked about for honoring Day including at the airport, the Convention Center, and even a bridge, "Then, Cissy Wyninegar, and the Women’s Club of FWB came to the Chamber of Commerce and said we have an unusual idea. We not only want to honor Col. Bud but we want to also honor Dorie, who has been a long time member of our organization. We want to have a trail." The trail begins at the offices of Warren Averett and continues along Nebraska Avenue, down California Drive, following a creek, and eventually ending at Ferry Park on Oregon Drive. Organizers call it a walking museum that will feature a Freedom Memorial with a flagpole, a photo wall, a bronze boot sculpture as well as quote plaques and life pavers along the way that mark various times in Day’s life. George “Bud” Day died in July 2013 and was a United States Air Force Col. and pilot, who served during WWII, the Korean War, and The Vietnam War. A former POW, Day was held for 5 years and 7 months in North Vietnam. He is a recipient of the Medal of Honor and the Air Force Cross. Mike Anderson, the Mayor of Ft. Walton Beach says it’s a tremendous idea to honor the couple together, "As important as it is to recognize Bud Day and all the things that he did, it’s also the spouses who, the POW/MIA wives who stayed behind to keep the family together and work very hard. I think it’s very appropriate that Bud and Dorie Day are being recognized." Dorie Day will be honored with a Viking Garden, which the Fort Walton Beach Women’s Club and Gulf Area Garden Club will maintain. George Day Jr., said he was proud of his parent’s patriotism and the trail would reflect that for future generations to see, "As this unfolds, as quotes and other words of inspiration are placed in various points along the trail that will be an inspiration to many for years and years and decades to come." The city broke ground on the trail in February, which would have been Col. Bud Day’s 89th birthday. Congressman of Florida’s 1st District Jeff Miller was in attendance and said the community welcomed the opportunity to showcase the couple’s life as well as the dedicated military of today, "And it is unique, in itself, a trail, where people can walk, can remember,can reflect, can think about the sacrifice that not only these two people have made, but that those that wear the uniform of all branches of this service. We were blessed to have Bud Day as part of our community; we are equally as blessed to still have Dorie." Organizers are looking to begin the first phase of the trail, pouring concrete once they’ve reached a certain threshold of the fundraising and hope to have the Ribbon Cutting in February 2015. More information about the trail and how the community can support it is available on line at F W B Chamber dot org. Jason Floyd of JDF Architecture in Shalimar designed the trail’s commemorative elements. Jeff Peters, the Director of Parks and Recreation for the City of FWB. 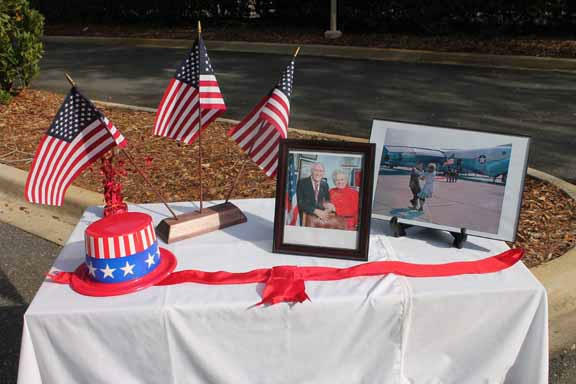 Support also comes from the residents currently living on the trail’s path and the veterans and active-duty personnel in the community from the four branches of the military that Bud Day served in-Air Force, Army, Marines, and U.S National Guard.